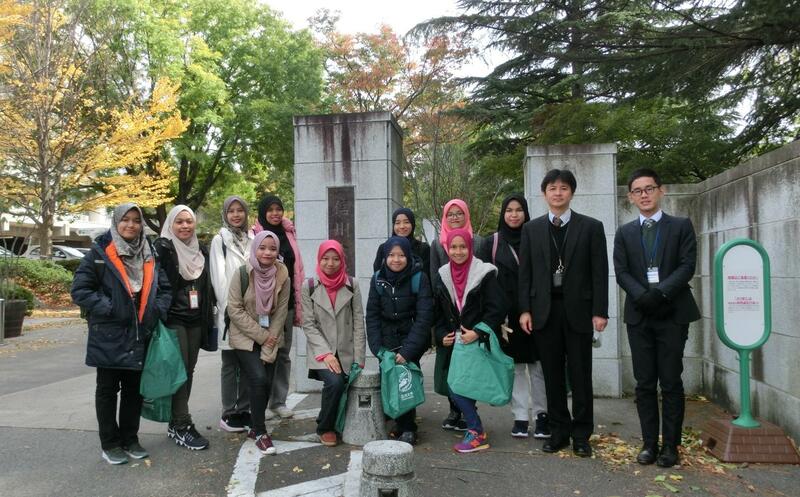 A short-term study program was held between Shinshu University (SU) and one of our partner universities, Universiti Putra Malaysia (UPM), between October 23 through October 31, 2017. This newly established short-term inbound exchange program was led by Associate Professor Hirokazu Nagata from Global Education Center (GEC). During the first half of the program, students from UPM participated in various activities in Matsumoto campus to gain some exposure towards the lecture style in Shinshu University. For example, they attended Introductory Japanese Language classes, taught by Specially Appointed Professor Naho Shimodaira from GEC, and some other classes offered by the School of General Education. Other than that, they were also given guided study tours to the SU attached hospital and the famous Matsumoto castle. These tours provided a valuable opportunity for the Malaysian students as well as Japanese students from SU, who were selected to support this program, a chance to communicate among one another and exchange opinions in various topics. During the second half of the program, students from UPM visited some laboratories in the Faculty of Engineering and facilities of Global Aqua Innovation Center (COI). They also had created great impact through their participation in the English Café. Furthermore, through the cooperation of a famous local company in Nagano Prefecture, they visited the history museum of the company and was provided a rare chance to gain knowledge about Japanese Industries through an interactive discussion with the person in charge from the company. On the last day, all students that joined in the program were given a certificate of participation from Shinshu University.